The Twain Shall Meet: David Anderson, Conservative MP Dumps Offensive Video, But it is Still on Youtube! and it is still offensive! David Anderson, Conservative MP Dumps Offensive Video, But it is Still on Youtube! and it is still offensive! It is true that David Anderson, Conservative MP from Saskatchewan has taken his offensive video off of his Official Webpage. It is also true that it remains where he either had it posted or found it on Youtube over 11 months ago. That bit of information seems to be intentionally being overlooked by the CBC and others in the Main Stream Media. On the one hand that gives it less visibility, but does nothing to address the issue that it is still there and the Moniker that claims it has just now justified it's existance. It is also true that Anderson admits that it contained offensive and unnecessary language insulting to many of Canada's First Nations citizens. Add to that that he fell short of an apology, and last and certainly much more newsworthy, the fact that it remains on Youtube! I took these screen shots just an hour ago. 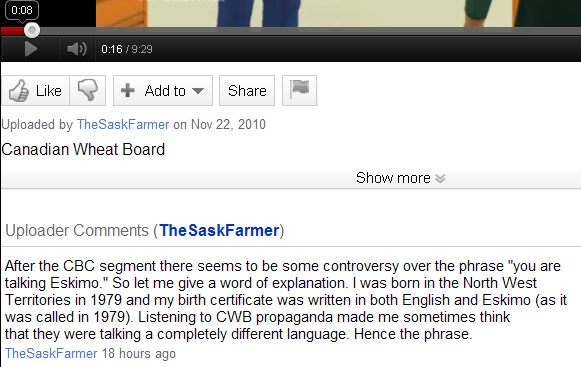 This is from the Youtube account of TheSaskFarmer, where the video can still be seen above, taking credit for composing the video. As I point out this is far from an apology, and it comes 11 months after the initial posting. I suspect that he was in part responsible for getting it on Anderson's website. I also suspect that he was very proud to have done so. and completely ignored the insanity of the argument he was making on their behalf. Sure, it was Propaganda, but come on! He wrote it himself. ﻿﻿ This is a sample of intelligent comments (they were not all so sensitive) that are found there. At any rate, this behavior is not what we expect from a Parliamentary Secretary in a serious and trustworthy government. But I am guessing that many of us are getting to the point where we take everything that the Harper Government has to say about anything with a grain of salt. And therein lies the sadness. To see more background on this story, see the blog below.